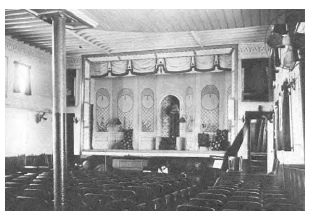 Appearing at least four times in Colonial Beach, the floating theatre visited 142 locations in eight east coast states. In operation from 1914 to 1941, it played as far north as Camden, New Jersey and as far south as Merritt Island, Florida. Mostly, though, it played in the small towns of the Chesapeake region and the Albemarle region of North Carolina. At the time of launch it was referred to as the "Playhouse" and weighed 436 tons, measured 128.3 feet long and 34 feet wide. It was the only showboat that Edna Ferber visited when she did research for her novel, “Show Boat,” which inspired the smash Broadway hit, opening at the Ziegfeld Theatre in 1927 and running for 572 performances. It lived on in the cinema, with the 1936 film version starring Irene Dunne, and again in 1951 with Ava Gardner and Howard Keel. The floating theatre played six nights in one town, Monday through Saturday, offering a different play each night. Titles like "Smiling Thru," "Cappy Ricks," "Trial of Billy Wells," "That Carnival Girl," as well as various vaudeville shows entertained folks with show prices around 25 cents per seat. Sadly, the James Adams sank four times during its 27 years in operation and was ultimately destroyed by fire on November 14, 1941 while being towed to Savannah, Georgia to be fitted as a cargo barge. Many are eager to see this wonder on the water once again serving coastal communities, so a local group has started an initiative to promote, build and operate a replica of the original show boat. The goal is to take performances from port to port around the mid-Atlantic region, to many of the same ports where the original James Adams played. Once built, the replica of the new show boat will operate as both a performance hall as well as a museum, housing exhibits featuring memorabilia from the original craft’s cast and crew, author Edna Ferber, the Kern/Hammerstein stage production of “Show Boat” and more. Chesapeake Bay Floating Theatre, Inc (CBFT) is a 501(c)3 non-profit professional theatre dedicated to revitalization, economic development, cultural enhancement and education through construction and operation of the James Adams II along with other community-focused projects.